I love to knit (you may have noticed) but when I’m going through a bad patch knitting just requires too much brainpower. Deciding on a pattern, finding yarn to suit, getting gauge, it’s just too many decisions. I find cross stitch really helps me. I don’t have to decide on the thread to use, it all comes provided in the kit, it has simple instructions and I don’t have to worry about fit. It’s also easy to see the progress that you’re making and can be set down and picked up again months later without worrying that your gauge has changed, or you can’t remember where you were in the pattern. This is my current project which I’ve been working on since Christmas. It’s a kit by Anchor that I picked up at The Knitting and Stitching Show in the Black Sheep sale, they don’t just sell of packs of wool very cheaply, they also have a good range of needlecraft kits. 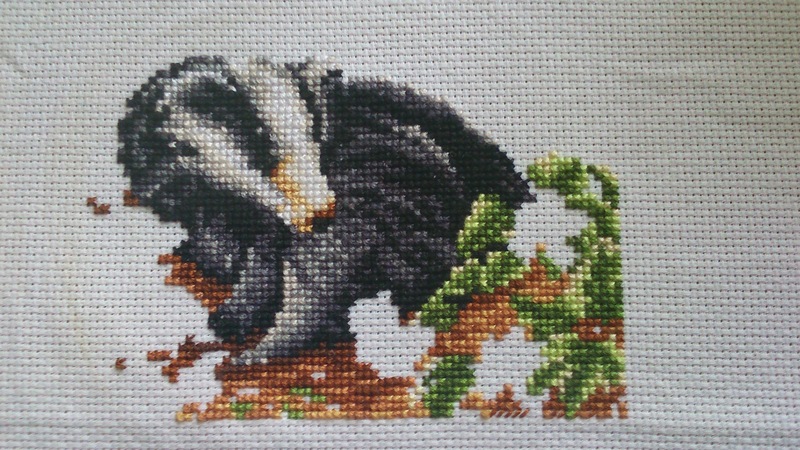 I’m working on the greenery at the moment, having finished with the 50 (ok 5 really) shades of grey for the badger.